To provide a richly varied environment in which children can begin to discover who they are in relation to other children and adults. To provide materials for children to explore space, the natural environment, use of their body, and the thinking process. To provide opportunities for children to try out behavior and to begin to understand their response of others to their behavior. To offer experiences which will allow children the right to make choices, thus enabling them to begin to develop their value system. The Happy Time Staff consists of two teachers. The following information is provided to give a brief introduction to each of the staff members. Sue DeStefano, Director: Sue holds a Bachelor of Science in Early Childhood Education from the University of Connecticut. She has taught young children for a total of 33 years — and has been at Happy Time since 1992. 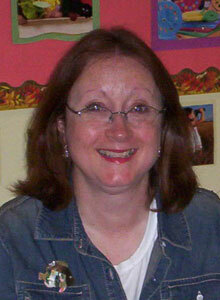 She has 2 daughters, both Happy Time alumni, and lives in Mystic with her husband, Carmine, and their 2 cats. Sue has 2 granddaughters, Kahlan, a Happy Time alumna, and Norah who presently attends. Linda Clark: Linda holds an Associate’s Degree in Early Childhood Education from the University of Maine at Farmington and has also attended the University of New Haven. Linda has a Head Teacher Certification and has been with Happy Time for 18 years. In addition, she has experience with home day care and public school education. Linda teaches both classes at Happy Time. She is the mother of three children, all of whom are Happy Time alums, and has one grandchild. Linda resides in Mystic with her husband, Bobby. Her grandson, Dominic recently moved to the area and will attend Happy Time in the fall.